Spinach and Homemade WW Pasta with Garlic Butter Sauce | Naturally. 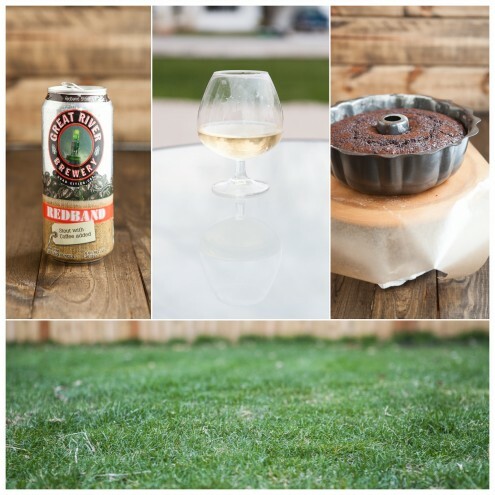 Instead I took an extra long walk with the dog, walked to work (it’s marvelous outside), practiced piano, read a couple chapters from Beethoven’s biography, made a coffee stout bundt cake, and mowed the lawn (on top of classes, lessons, and rehearsal.) I know it’s only the first day but dang, I feel good. I’ve been getting tired around 11 am and I’ve blamed the slight bought of anemia I’ve had, but honestly, I think it was how much I was on the computer and not focused. I can’t tell you how many times I thought, “oh I’ll just check this or oh I’ll just tweet that” but then, it felt good not to. Now I’m sitting outside, with a glass of wine, feeling highly accomplished. So accomplished that I felt I wanted to share this recipe with you. I’ve already received two wonderful gallon bags of spinach from the csa and when you’re a family of one, you start finding ways to add spinach to everything. However, I really wanted a dish that would showcase just the spinach (as I feel it sometimes gets shoved back as an “extra.”) This red spinach has such a lovely flavor that it’s a shame to hide it! If you are running short on time you can always use store bought pasta but I think that the hearty whole wheat helps make the dish. I’ve opted to stop using my kitchen aid attachment to make pasta (for the time being) to hopefully show everyone how easy it is (and you don’t need any special equipment.) You can also watch my ravioli video that shows the first few steps! Combine whole wheat flour and salt on a clean surface. Make a well, add egg and water. Using a fork, whisk egg and slowly begin to incorporate flour. Bring a pot of water to a boil. Toss pasta in and let cook for 3-4 minutes, pasta should rise to the top. Melt butter in sauce pan. Add in garlic and rosemary, cooking until garlic is fragrant. Toss with freshly cooked pasta and spinach. Let cook for a minute or two until spinach just begins to wilt. Serve with a bit of grated parmesan cheese. At least I didn’t say I practiced it well 🙂 I love piano but it’s always been my weak point in my music career! This is so creative! Awesome idea! The whole wheat pasta looks so hearty and wonderful!! .Looks Delicious! You have convinced me to try making pasta. I don’t know why pasta is so intimidating to me, I make bread, biscuits, and pie crust, but pasta has always made me go stiff. I’m going to brave it. This looks too good not to. 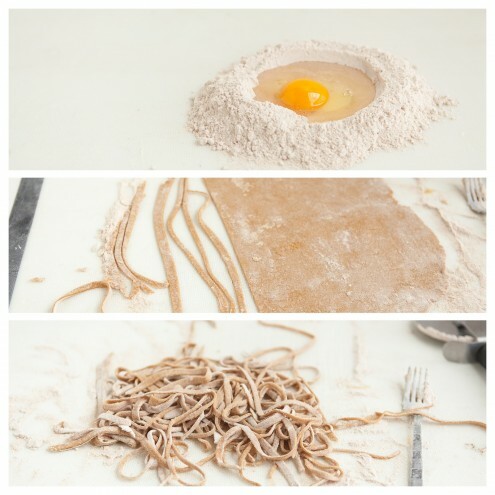 For a long time, I was terribly against trying to make my own pasta but once I started doing it, I loved it! I love how simple this is… Most of the time, the simplest of foods, is the best. Isn’t it such a wonderful feeling when you get so much done in a day? Nice egg flour volcano picture! Thank you and yes, I think the feeling of accomplishment is the best! Such a beautiful simple pasta. Ok, you’ve convinced me, first with the ravioli and now this… I’m gonna try making my own pasta soon. 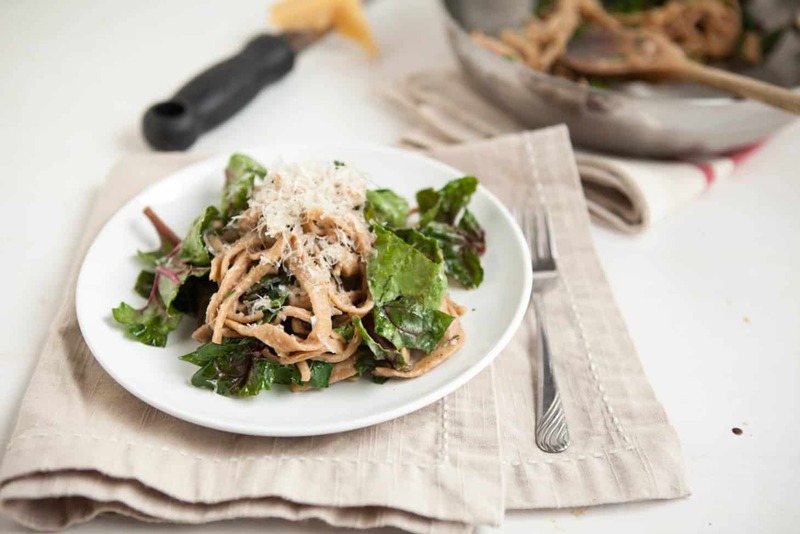 I’ve never attempted making whole wheat pasta, but it looks so delicious! beautiful pasta dish! definitely inspiring me to break out the pasta machine that is lying stagnant in the cupboard! Beautiful and earthy! I love the simplicity of garlic, butter, and the spinach. Love it! I’m so glad you’re feeling better! It’s amazing what a break from technology does to you. Tonight instead of staring at my computer screen (after I’m done commenting), I’m going to just lay in bed and listen to music. It’s going to be glorious! 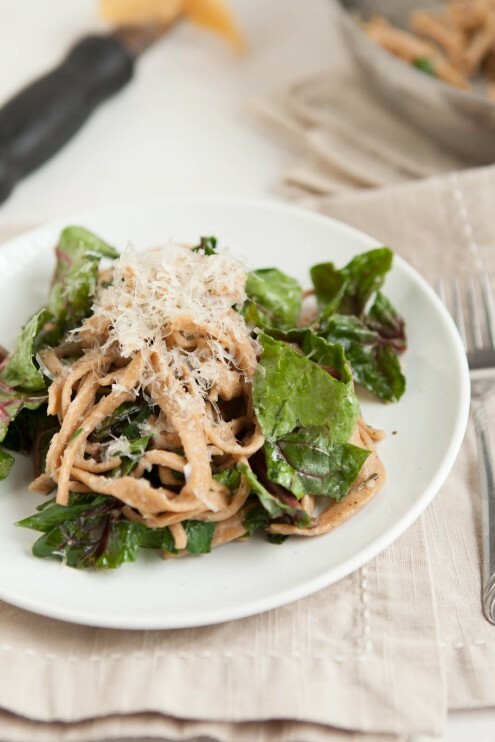 I love the simplicity and yet deliciousness of this pasta.